Description: Enjoy the rich, classic styling and distinctive sophisticated look of Palmira. 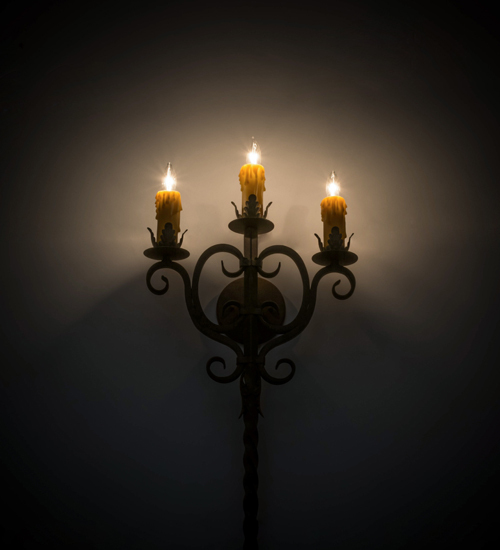 A candelabra of three Honey Amber faux candlelights is perched atop of three custom tailored bobeches with an elaborate scrolled frame. The fixture also features a long steel stem with a braided look and embellished with a decorative accent for aesthetic appeal. Stunning Solid Steel hardware is hand forged and hand finished in an Organic Rust hue. The fixture is custom crafted by highly skilled artisans in our manufacturing facility in Yorkville, New York. Custom sizes, designs, colors and dimmable energy efficient lamping options such as LED are available. The sconce is UL and cUL listed for damp and dry locations.